Artavazd Peleshyan meets Félicien Rops. Two artists inspired me to transform the raw material of a childhood memory into a new work in which the former represents the raw power of life and the second the mockery of death. 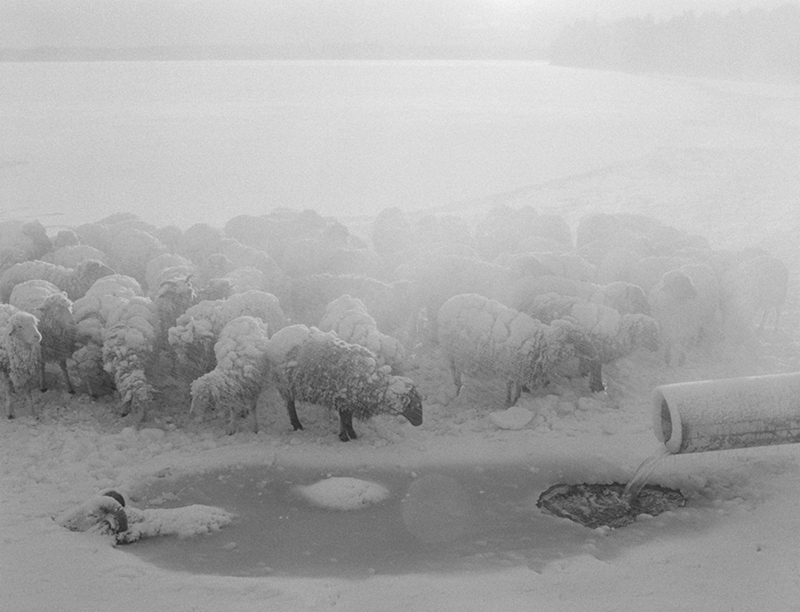 In Peleshyan’s brilliant film The Four Seasons shepherds slide down from mountain slopes with their animals, dig them out of the snow and plunge into fast-flowing rivers while holding the sheep. The sheep are seen as extensions, almost as family of the shepherds. This film has an early Christian undertone and an enormous life force. Robs is mainly about the rawness of skeletons that dance between flowers in which death is not silent but has an uncanny vitality. It’s no coincidence his work is used for Baudelaire illustrations. The starting point is a childhood memory. As a child I lived by the side of the river Maas in the countryside (the neighbors lived two kilometers away). It was a harsh winter. The river froze over and a thick layer of snow covered the land and the ice. 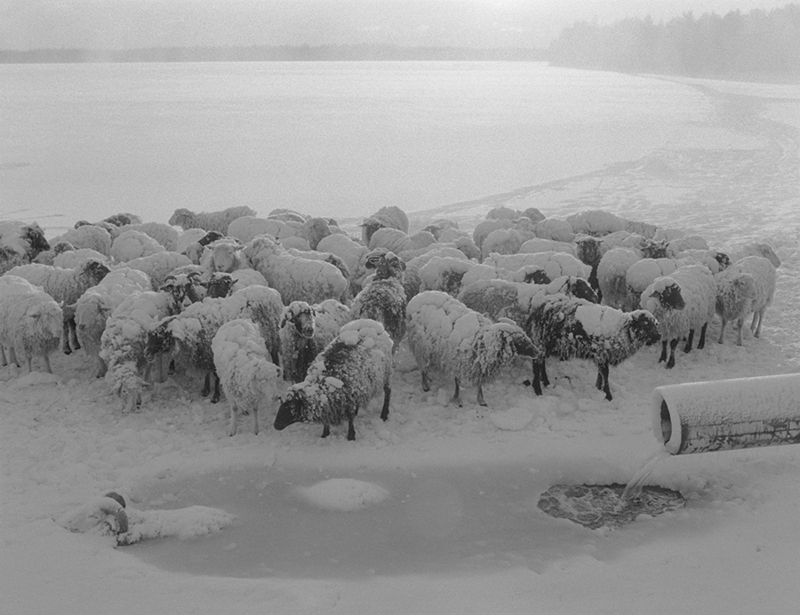 I looked out the window and saw a herd of sheep had walked onto the river and some had sunk through the ice. 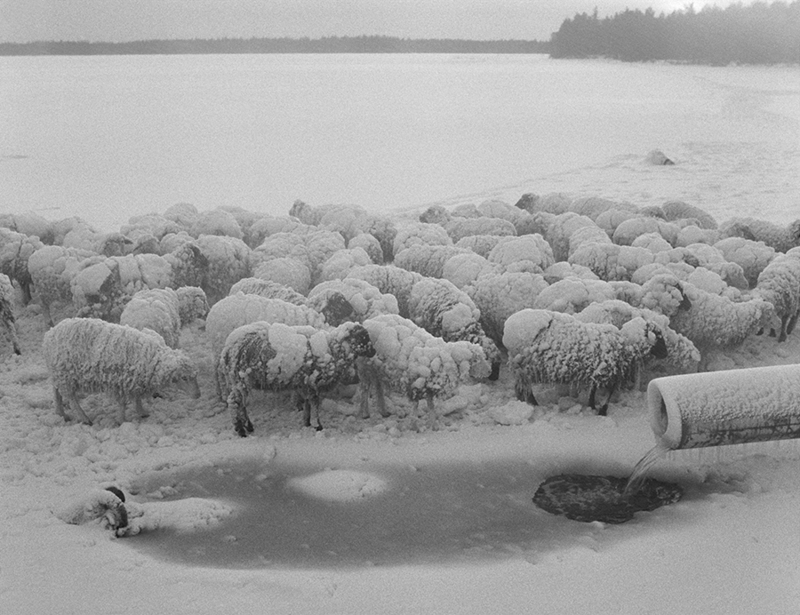 A few sheep had fallen into the waterhole and the remaining sheep sat around it patiently in the middle of a blizzard. There was already a lot of snow on the sheep. Snow-white snow on dirty white bales of wool. They just sat there. Maybe the ice was too slippery for them to get up or maybe they did not dare to continue in the storm, but to me it felt as if they were mourning. The snow on the edge of the hole had sucked up a puddle of blood, as a sheep that had fallen into the hole had attempted to climb out and had cut itself on the sharp edge of the ice. There was no movement visible and the animals were sitting dead still on the ice. The ‘subject’ was therefore as good as dead. If the ‘subject’ of a movie is dead, you must ensure that the image remains alive. It is like Hitchcock in Birds. You see a woman who was pecked to death. She lies motionless on the floor but in the foreground you see a dripping tap. That dripping tap keeps the image alive while the subject of the scene, the woman, is dead. 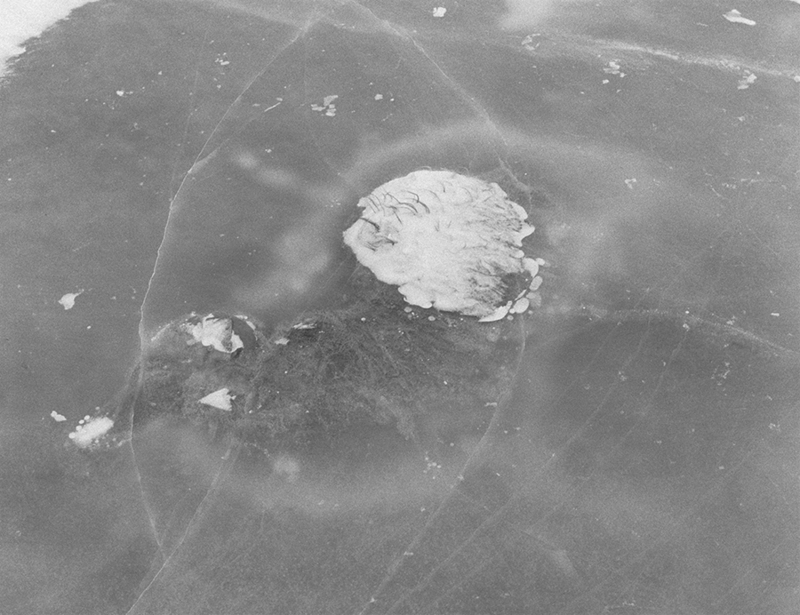 In order to reconstruct the image from my youth, I made a hole in meter thick ice on a lake in Finland. That hole was made with a chainsaw, which is how they make swimming pools in the ice in Russia. The hole was oval and had a diameter of about six meters. Seventy sheep sit around the hole. 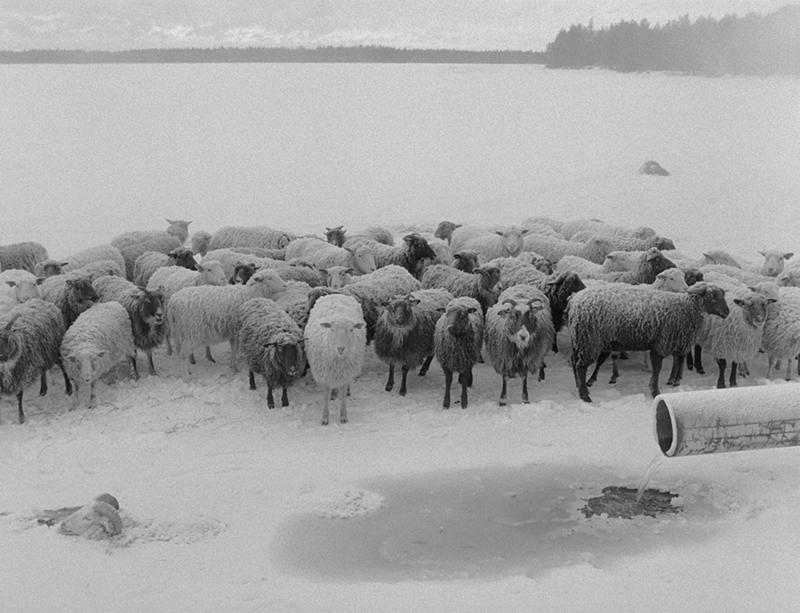 Although the sheep in my film are not dead, they do not move, or hardly so, and that is why, in order to keep the image alive, I put a rusted metal pipe in the picture, from which a constantly gurgling stream of water runs into the waterhole around which the sheep are sitting. This is the choice that turns the memory into art by creating a semiological field of meaning. The image becomes ‘readable’.